The task force will be led by Veterans Affairs Secretary Robert Wilkie. President Donald Trump signed an executive order Tuesday establishing a new task force aimed at empowering military veterans and ending the suicide epidemic among them. "To every veteran I want you to know that you have an entire nation of more than 300 million people behind you, you will never ever be forgotten," Trump said in a signing ceremony at the White House, flanked by state and local officials as well as representatives from several veterans' groups. The order, titled the "President's Roadmap to Empower Veterans and End a National Tragedy of Suicide," or "PREVENTS," will require top officials from multiple government agencies to coordinate a strategy to tackle the issue of veterans suicide and release recommendations to the president within the next 365 days. The group will be led by Veterans Affairs Secretary Robert Wilkie. (Jonathan Ernst/Reuters) President Donald Trump speaks before signing an executive order on veterans suicide prevention in the Roosevelt Room at the White House, March 5, 2019. In an interview with 'Fox and Friends' on Tuesday, Wilkie said his agency estimates that 20 veterans take their lives every day in the U.S.
"The sad thing is that 14 of those 20 are outside of our veteran system," he said. "We will bring the best medicine, the best social science in addition to going to the Congress and asking for grants and money to give to our states and localities so they can help us in this fight." According to a senior administration official, the White House has yet to put a price tag on the grants that will be doled out to state and local governments in coordination with veterans advocacy groups. The official said the order will also task agencies with developing a national research strategy in coordination with public and private stakeholders in order to have a more complete picture of the challenges facing veterans once they exit the service. The order follows comments from Trump last November about post traumatic stress disorder and veterans that sparked a major backlash. The order comes after Trump made comments in November about post traumatic stress disorder and veterans in relation to Ian David Long, a Marine veteran who killed 12 people and himself in California. Officials suggested that PTSD may have played a role and Long had been flagged to law enforcement in the past. When Trump weighed in on the shooting, he focused on Long’s mental health. "He is a very sick puppy ... He served time. He saw some pretty bad things," the president said. "They come back, they're never the same." According to government data, around 2.7 million service members served in Iraq and Afghanistan since 2001. Of those veterans, 15.7 percent screened positive for PTSD. 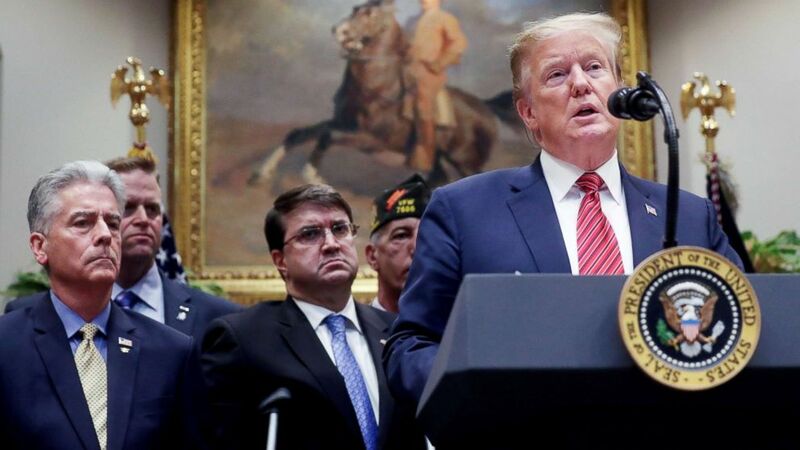 "This grave problem can only be solved if our entire country works together to build communities that truly serve, support and protect our veterans from the first moment they return to civilian life," Trump said Tuesday. "We must keep our promises to those who keep us free." ABC News' Karen Travers contributed reporting to this article.